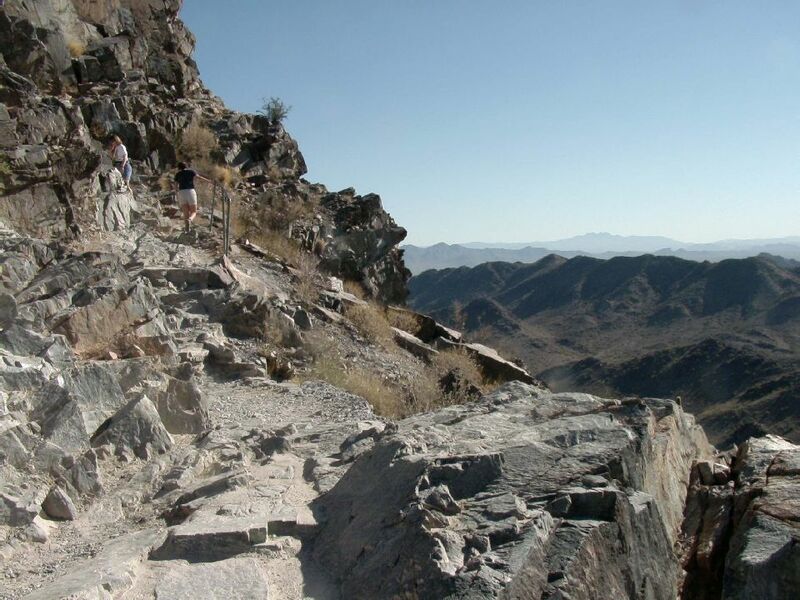 The summit trail of Piestewa Peak is a very moderate grade (very much the same as the Grand Canyon) until you get to the 3/4 point. The incline is much greater after this and you gain elevation very quickly with sharp switchbacks. The railing you see is supposedly a horse hitching post, although horses haven't been allowed on this trail for over 30 years, and I can't imagine horses getting this far on the trail. If they did, however, going beyond this point would be nearly impossible. This is a resting spot for many first time hikers who have discovered how difficult the trail can be and are now thinking of turning back. I've been asked on many occasions, "How much farther is it?" The answer is 150 feet. At the right in the distance is Four Peaks. You can climb the leftmost (north) peak which I have done only once. They are 7500 feet in elevation.